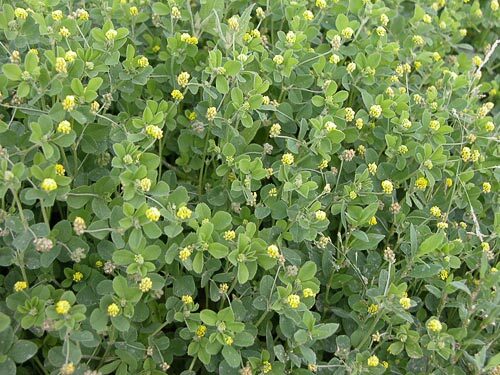 AgroAtlas - Crops - Medicago lupulina L.- Black medic. Medicago lupulina L.- Black medic. Family Leguminosae Endl., genus Medicago L., subgenus Lupularia (Ser.) Grossh. Chromosome number: 2n=16, 32. Annual, rarely perennial herb. Very polymorphic species with winter or autumn varieties. Plant is low-growing, main-rooted. Stems are thin, procumbent from 15 to 70 cm tall. The leaves are pinnately trifoliate. Flowers are small, 2.5-3.5 mm long, bright yellow, 15-35 flowers in densely packed raceme. Blossoms from June to October, seed maturity can be expected from July-November. The seeds are borne in individual pods which turn black at maturity. The weight of 1,000 pods is 1.7 to 1.8 g. Self-pollinated. Reproduction occurs by vegetation and seeds. The species is characterized by high content of hard seeds. Introduced into culture at the end of 18th century. Cultivated on small squares in the forest area of 2 regions and republics of former USSR. 2 breeding cultivars have state permission for utilization. Species is not widely distributed because of difficulties with seed production. The species prefers open habitats with low herbage. Cold tolerant, especially of spring frosts and early frosts. Not tolerant of acidic, dewy heavy soils. In spite of low tolerance to drought the species forms good seed yield in dry years and good herbage in wet years. More susceptible to water loss than the more drought-resistant forage legumes, e.g. birdsfoot trefoil, sainfoin. Intolerant of long periods of waterlogging. Valuable component in complex herbage mixtures. Species is remarkable due to high protein, vitamin and microelement content. Characterized by good regrowth after cutting, tolerance to trampling and grazing, and long vegetative periods (through early frosts). Increases soil fertility. An excellent lawn plant. Forage mass productivity ranges from 5-11 MT/ha, hay productivity ranges from 1.5-3.0 MT/ha and seed productivity is 300-500 kg/ha. Medvedev P.F., Smetannikova A.I. The forage crops of European part of the USSR. 1981. - L.: Kolos, 336 pp. (in Russian). Shashko D.N. Agroclimatic region of the USSR. 1967. - M.: Kolos, 335 pp. (in Russian). Shashko D.N. Agroclimatic resources of the USSR. 1985. - M.: Kolos, 248 pp. (in Russian).